For more information about Phi Alpha Theta National History Honor Society, please visit their website. The Alpha Nu Gamma chapter at Cal Poly is now beginning its second year and we are excited to be planning a number of events for students interested in history. Undergraduate students must complete a minimum of 16 units in History, achieve a minimum GPA of 3.1 in History and a GPA of 3.0 or better overall. A maximum of 4 credit hours of online, transfer, or AP credits may be applied to the membership eligibility requirement. Membership is not limited to History majors. Graduate students should have completed a minimum of 16 units towards their Master’s Degree in History, have a GPA of better than 3.5, and shall have completed approximately 30 percent of the residence requirements for the Master’s Degree. If you are apply transfer credits to your GPA, you must submit an official transcript along with your application. There is a one time membership fee of $50 that can be turned in with your application. Applications are available from the History Department office. 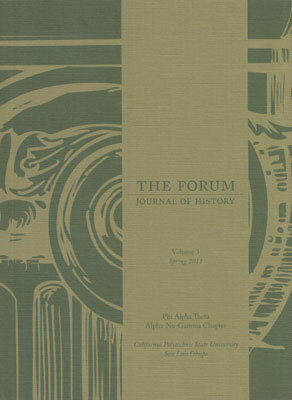 The Forum is Phi Alpha Theta's national award winning history journal. It is written, designed and produced solely by students and epitomizes Cal Poly's "Learn by Doing" mantra. The Forum is currently open for submissions. Please direct papers, recommendations, and any questions to calpolyforum@gmail.com. We are very pleased to announce that Volume 3 of The Forum, our student-produced historical journal, has won another national award. It has been awarded 2nd prize (print category) in the 2011 Gerald D. Nash History Journal Award given by the Phi Alpha Theta History Honor Society national headquarters, which represents 860 chapters nationwide. Phi Alpha Theta Executive Director, Dr. Graydon A. Tunstall, University of Southern Florida, in the letter of notification to Dr. Tom Trice, co-advisor (with Dr. Molly Loberg) of The Forum, praised the "time and effort your chapter devotes to produce such an outstanding historical journal. The continued high quality of your publication clearly exemplifies the dedication of you and your peers to the study of history." The History Department is very proud of our students and their excellent work, which is just one example of how the Cal Poly philosophy of "Learn By Doing" works in the study of history. This makes two award-winning volumes in a row for The Forum; in 2010, Volume 2 was awarded 1st prize in the electronic journal category and 3rd prize in the print journal category of the Nash History Journal Award. Congratulations again to all the students who worked so hard on this volume of The Forum!